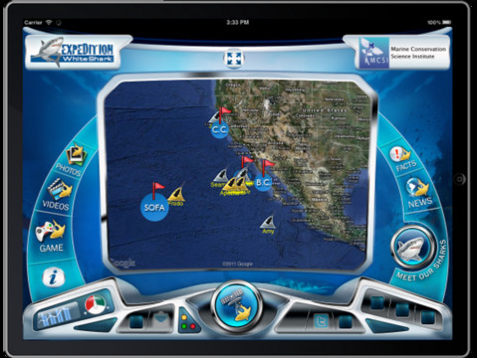 For those who watched National Geographic Channel's limited series Expedition Great White, where marine biologist Dr. Michael Domeier tagged great white sharks with satellite tracking tags, there is now a companion app for iPhone, iPod, and iPad that allows you to see, in real time, the latest progress in monitoring the location and migratory routes of the sharks that were tagged. 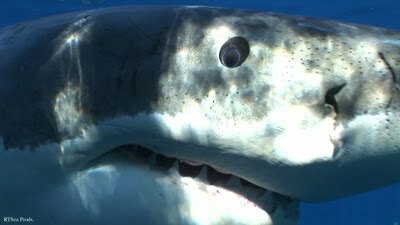 The Expedition Great White series generated considerable controversy among many shark advocates and shark researchers in large part due to the methods used to capture and secure the animals so that tags could be attached and other tests could be performed, like blood and sperm samples. There were issues raised as to whether the elaborate procedure employed to corral the sharks was causing more harm than good and Domeier is currently evaluating the capture procedure and the method of securing the tags themselves to hopefully minimize short- and long-term harm. While Domeier's current and future methodologies will be scrutinized by many in the shark research and conservation community, the new app does provide some interesting information for the curious that might not be obtained unless a deliberate effort was made to seek it out and and read about it. Such is the clever attraction of many of today's apps. With Domeier's app, called Expedition White Shark, you can view the latest position data for a group of tagged sharks and examine their past tracking patterns over time as they migrate between either Isla Guadalupe (off Baja, Mexico) or the Farallon Islands (off Central California) and the mid-Pacific area Domeier refers to as the Shared Offshore Foraging Area (SOFA), also referred to as the "White Shark Cafe" by other researchers. There are other features to the app including pictures and videos - although their operations were a bit clunky in actual use; videos did not present themselves in the right aspect ratio or screen size, so some distortion occurs and many of the other images are of lower resolution. Perhaps that will be corrected in future updates. The app also includes some interesting great white shark facts and a game for children that takes a juvenile white shark through its early years to sub-adult. Personally, I find the real time tracking of the sharks to be the most interesting feature. My primary concern is that to gain this kind of information, which other researchers have also provided by using more "conventional" means, I hope that, in the future, Dr. Domeier will be able to develop capture techniques that will prove less traumatic for the animals thereby garnering more support from the shark community as a whole. Available on iTunes, proceeds for the $3.99 app go to Domeier's San Diego, California-based research organization, Marine Conservation Science Institute. The institute is currently working with the Guy Harvey Ocean Foundation on tracking tiger sharks in and around Florida and the Caribbean.